The RealMe U1 is the world’s first smartphone, which comes with a MediaTek Helio P70 processor. The smartphone finally got launched in India on November 28. We are comparing the device with the Xiaomi’s Redmi Note 6 Pro to see which one offers better specifications? The RealMe U1 is the first smartphone in the U series. The smartphone features a 25MP camera at the front and comes with a water drop notch on top of the display. On the other side, the Xiaomi Redmi Note 6 Pro, which is the company's first smartphone with a dual camera setup at both front and back is launched recently in India at a price of Rs 13,999. So, let's begin with the comparison to see which one is offering the best in comparison to other at least on paper. Let’s begin with comparing the display of these two smartphones in detail. 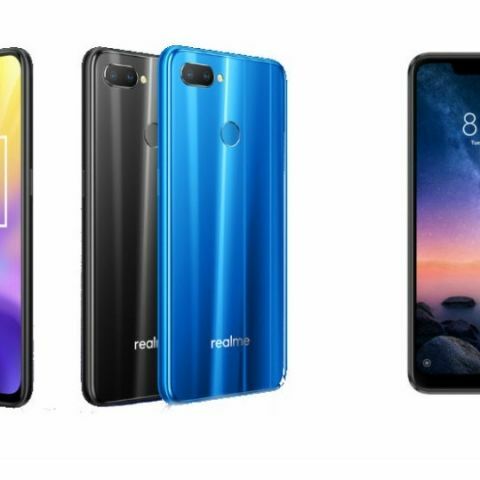 The RealMe U1 Sports a 6.3-inch display with a resolution of 1080 x 2340 pixels, while the Xiaomi Redmi Note 6 Pro sports a 6.26-inch display that offers a resolution of 1080 x 2280 pixels. 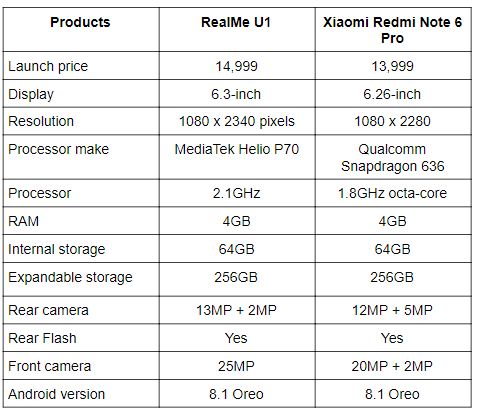 When it comes to the processor, the RealMe U1 is the world’s first smartphone that features a MediaTek Helio P70 processor, while the Xiaomi Redmi Note 6 Pro is backed by a Qualcomm Snapdragon 636 processor. As far as the cameras are concerned, the RealMe U1 sports a dual 13MP + 2MP rear camera with a 25MP sensor on the front. On the other hand, for the very first time, Xiaomi has launched a smartphone with a dual camera setup at both front and back. The Xiaomi Redmi Note 6 Pro has a dual 12MP + 5MP rear camera with a dual 20MP + 5MP front camera. The RealMe U1 has been launched in India at a price of Rs 11,999, while you can get the Xiaomi Redmi Note 6 Pro for Rs 13,999.